Do you listen to music in the kitchen? Sometimes I listen to a shuffled mix of music, or I’ll play live a local radio station from their website, or I’ll pick something on Pandora. When I pick something specific, more often than not it’s jazz. And, Sarah Vaughan is one of my favorites. When I read the head note for the recipe shown here today (see below), I was inspired to turn on the music and start baking. 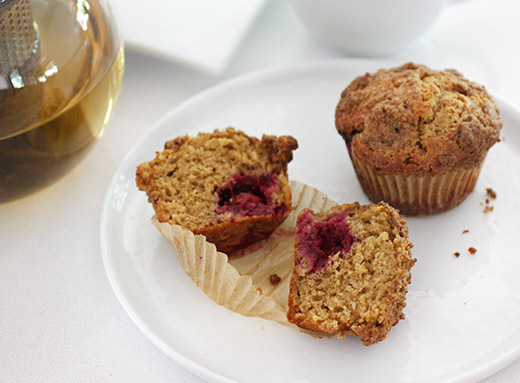 These blackberry muffins are from Patty Pinner’s latest book Sweet Mornings , and I received a review copy. This is a collection of sweet, and some savory, breakfast treats Pinner has put together over years of gathering recipes from the women in her family and women from her neighborhood. The recipes all come with stories, and she writes: “my recipes are testimonials to all I’ve learned, listened to, and observed in the kitchens of other women.” It makes you want to slow down in the morning, invite your neighbor in, and chat for a few minutes over hot tea and something sweet. And, if you like coffee cakes as much as I do, this is a book you’ll want. In addition to the muffins, scones, biscuits, rolls, sweet loaves, pancakes, and doughnuts, there are no fewer than 25 different types of coffee cake. There’s a Rhubarb Coffee Cake, Pistachio Coffee Cake, Nutmeg Coffee Cake, Blueberry-Cornmeal Coffee Cake with Streusel Topping, Eggnog Crumb Coffee Cake, and a Peanut Butter and Jelly Coffee Cake to name a few. Don’t they all sound great? But, I had been eagerly awaiting blackberry season and had to try these crumb topped muffins first. Due to the nature of my love of a crumb topping, I should mention that I learned a lesson from another crumb topping aficionado years ago. That lesson was to always double the crumb topping quantities. Ignore that suggestion if you’re not as crazy for crumb topping as I am. Making that crumb topping is step one. Flour, sugar, cinnamon, and salt were combined in a bowl, and butter was worked into the mixture. I used coconut palm sugar which gave mine a darker brown color than it would have had with granulated sugar, and as usual, I doubled the quantities. To prep the pan, I used muffin cups rather than greasing and flouring the pan. Making the batter was a simple matter of combining the dry ingredients including flour, more coconut palm sugar for me, baking powder, baking soda, cinnamon, lemon zest, and salt. A well was made in the center of the mixture. In a separate bowl, yogurt, melted and cooled butter, eggs, and vanilla extract were combined and then poured into the well in the dry ingredients. The batter was carefully stirred together so as not to overmix. 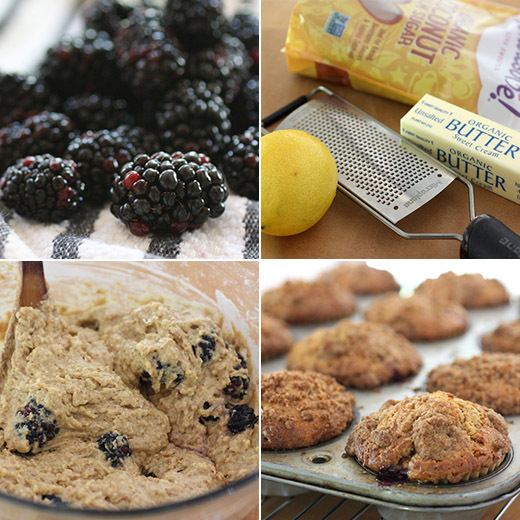 Next, blackberries were folded into the batter before it was spooned into the muffin cups. The crumb mixture was sprinkled on top of each muffin, and they baked for about 25 minutes. 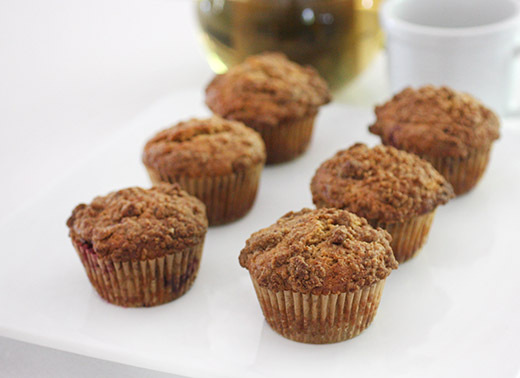 A hot cup of tea went perfectly with these fruity muffins, and I had received a selection of organic teas from Teavivre to try. The Organic White Peony was subtly floral and lovely. It’s a very light bodied tea that was delicious hot and iced. Next, I tried the Hangzhou Tian Mu Qing Ding Green Tea which is a slightly grassy green tea with great flavor. 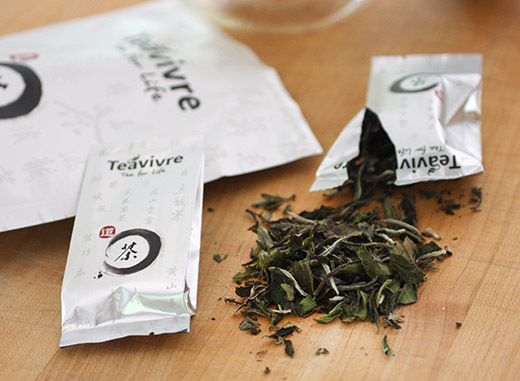 Another green option is Tian Mu Mao Feng, and this one is milder in flavor and lighter in color. These are high quality, loose leaf teas packed in sealed, airtight packages. And, they’d be great with all those coffee cakes too. Reprinted with publisher’s permission from Sweet Mornings by Patty Pinner, Agate Midway, 2016. In 1965, jazz was everywhere. It floated out of project buildings and penthouse windows alike. Daddy listened to Thelonious Monk, John Coltrane, Louis Armstrong, and Count Basie on homemade 8-track cartridges he bought from Mr. Manning, who made them in his garage. I guess you could say that making tapes was Mr. Manning’s hustle. Sarah Vaughan was Mama’s favorite singer. She loved Miss Vaughan’s lush voice and played Miss Vaughan’s “My Favorite Things” over and over on a small stereo in the kitchen. Mama baked while Miss Vaughan’s velvety voice sang on. And the music came out in her cooking—the morning sweets she made were as plush and smooth as cool jazz. These Crumb-Topped Blackberry Muffins are a case in point. 1. To make the topping: In a small mixing bowl, combine the flour, granulated sugar, cinnamon, and salt. Using your fingers, a pastry blender, or the tines of a fork, cut the butter into the flour mixture until it becomes crumbly. Set aside. 2. Preheat the oven to 400°F. Grease 2 8-count muffin pans with the cooking spray. Set aside. 3. To make the batter: In a large mixing bowl, sift together the dry ingredients: the flour, granulated sugar, baking powder, baking soda, cinnamon, lemon zest, and salt. Make a well in the center of the mixture and set aside. 4. In a small mixing bowl, combine the wet ingredients: the yogurt, butter, eggs, and vanilla extract. Add the yogurt mixture to the flour mixture and stir until the batter is moistened. (Do not over mix; the batter should be lumpy.) Carefully fold in the blackberries, ensuring they are evenly distributed and that the fruit does not become broken up. 5. Divide the batter evenly among the cups of the prepared pans, filling each about 1/2 full. Sprinkle each evenly with the topping. Bake for 25 to 30 minutes, until a wooden toothpick inserted into the center of a muffin comes out clean. 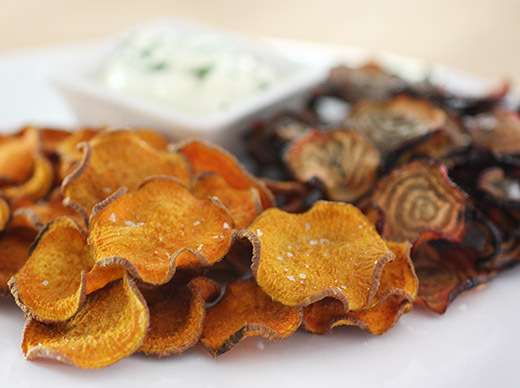 Remove from the oven and set aside to cool in the pans on a wire rack for 10 minutes. 6. Using a serrated knife, separate the muffins from the pans and then tap the pans gently on the counter to release the muffins. 7. Transfer to a serving platter and serve warm. Did you see the film The Hundred Foot Journey? Do you remember the omelet-making scene? That omelet was the creation of Floyd Cardoz who was the consulting chef on the film. It’s also found in his new book, Flavorwalla , of which I received a review copy. In the book, he explains that a walla in India is someone who sells something specific or is particularly knowledgeable about a topic. A paowalla is someone who sells bread. Floyd Cardoz is the flavorwalla because he has “made his mark as a creator of bold, exciting food with balanced layers of flavors and textures that play off each other.” The recipes reflect his varied style of cooking with a mix of cultural influences. There are Mexican, Thai, Moroccan, and Portuguese influences in the dishes as well as Indian flavors. The common thread is the use of spices, herbs, and aromatic ingredients to punch up the results. There’s a Spiced Chicken Soup with Chickpea Noodles that sounds like it’s guaranteed to lift you from feeling under the weather. It’s made with cinnamon, cloves, cumin, scallions, ginger, fresh chiles, and homemade noodles with chickpea flour. I was intrigued by the Yellow Lentil “Dal” enriched with whisked eggs stirred in at the end. And, the Stewed Chicken with Fresh Tomatoes with chipotle, ginger, turmeric, and tamarind paste sounds great for late summer tomatoes. There are other egg dishes in addition to the omelet like Oven-Baked Eggs with Poblanos and Fingerling Potatoes and Coddled Eggs with Crab, Grits, and Leeks. There are quick meals for weeknights and dishes that are perfect for parties, and there are a few cocktails as well like the Tamarind Margarita. 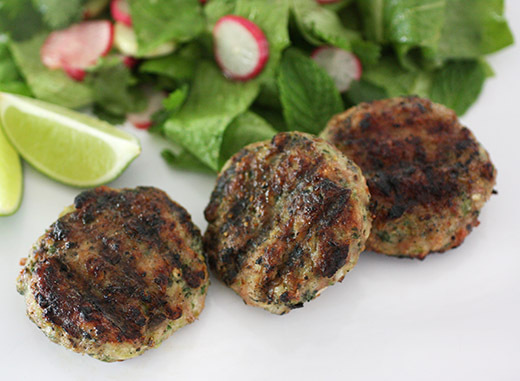 I fired up the grill for the Ground Chicken Kebabs because of the big flavors from ginger, garlic, mint, and serrano, and they were great served with the fresh, zesty Romaine Salad with Lime and Thai Chile. Cardoz explains that in many places in the world “kebab” is anything grilled whether it’s a cut of meat or piece of sausage or something formed into a patty. It doesn’t always involve food on a stick. And so, these patties were not skewered, just grilled as is. Two cloves of garlic, an inch of ginger peeled and cut into coins, and half a serrano chile chopped were combined in a food processor and finely chopped. Two tablespoons of cilantro and two more of mint leaves were added and finely chopped. A half cup of finely chopped onion was added to the mixture along with salt, pepper, and a half teaspoon of Garam Masala. The mixture was worked into a pound of ground chicken by hand. Lately, I’ve been buying humanely-raised, pastured chicken from Smith and Smith Farm at the farmers’ market and have been completely avoiding industrially-raised chicken. Direct from the farm, they sell whole chickens, pieces, and even boneless breasts and packs of ground chicken. So, once mixed, the chicken was formed into small patties that were refrigerated while the grill was being prepped. I brushed each side of the patties with vegetable oil and seasoned them with salt and pepper before placing them on the grill. They only need about three minutes per side depending on the heat of the grill. The dressing for the salad was made with canola oil, lime juice, fish sauce, minced ginger, and a minced Thai chile. It was tossed with chopped romaine, sliced radishes, cilantro leaves, and mint leaves. I served the kebabs with lime wedges and the salad on the side. 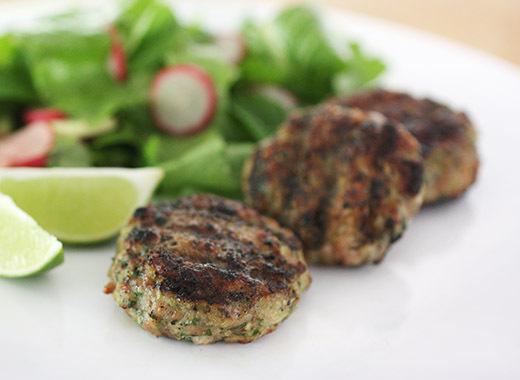 The simplicity of little, grilled patties made the brightness of flavors even more unexpected. 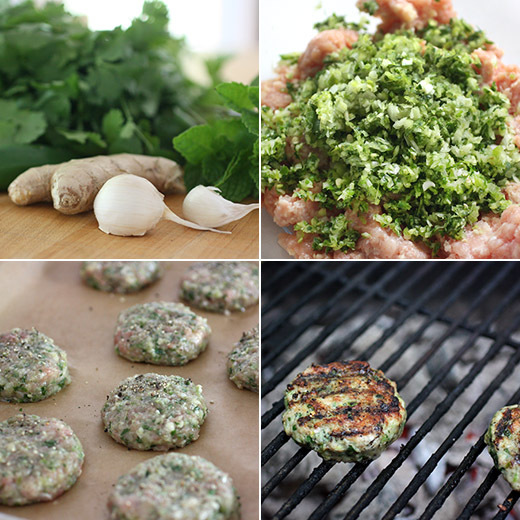 The squirt of lime on each kebab brought out the herbs, ginger, and chile within. A bite of kebab with a bite of fresh, crisp salad made an ideal mix. If you’re looking to add more spice and interesting flavors to your cooking, this book would be a great place to start. 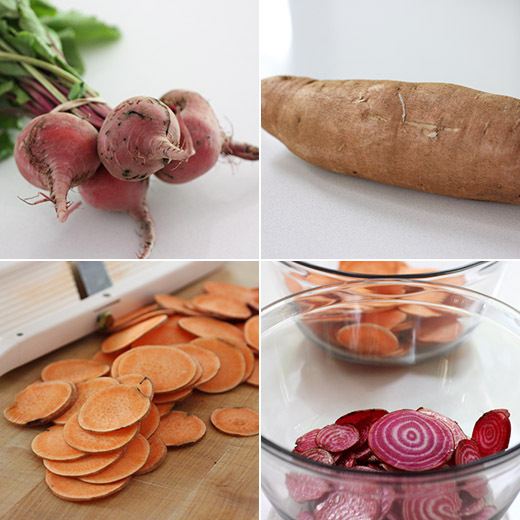 The topic of authenticity in relation to cuisines seems to pop up frequently lately. What is truly authentic to a place and time? When are outside influences permitted within what’s thought to be authentic? It’s not always black and white. I like the approach taken in Tasting Rome: Fresh Flavors and Forgotten Recipes from an Ancient City by Katie Parla and Kristina Gill. I recently received a review copy of the book. The authors, both American, became acquainted in Rome as they were both documenting the city’s dishes. They “enjoyed celebrating new flavors and breaking down the stereotype that Roman food must be hypertraditional in order to be authentic.” In fact over the centuries, there have been varied influences, from spice trade to immigration, on what has become Roman cuisine. This book, with both traditional and contemporary dishes, “focuses on the foods that best communicate the spirit of the Roman flavors,” and there are new twists that even include finding those flavors in cocktails. For instance, the Carbonara Sour di Co. So. 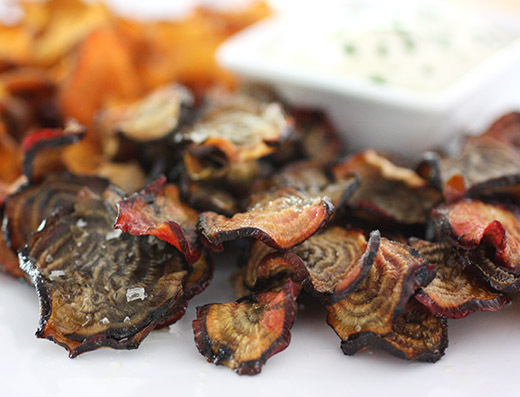 is made with guanciale-washed vodka and a pinch of black pepper. There are also true classics like Torta Rustica, which is a savory pie filled with greens, and Cacio e Pepe. I liked that the Pollo alla Romana recipe spans generations by staying true to the original concept of a braised dish with wine and peppers with a contemporary spin of using leftover deboned meat and sauce on sandwiches. There are historical facts strewn about the pages and a section devoted to Cucina Ebraica, the distinctive cuisine of Roman Jews who were once confined to a walled Ghetto in the city. There are pizzas and breads, vegetable dishes, meat dishes, poultry dishes, and fish dishes. And, there are sweets and drinks as well. I’m looking forward to using summer vegetables for the Verdure Gratinate al Forno with the seasoned breadcrumb topping. I also want to try the Concia which is fried and marinated zucchini, and this too sounds great suggested as a sandwich filling. I was quickly drawn to the bread chapter by the cute, little Pizette made from rounds of puff pastry and topped with thick tomato paste and oregano. 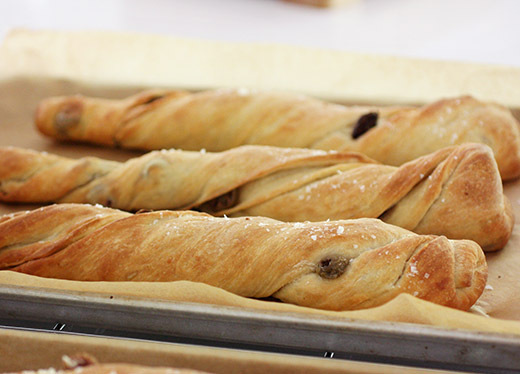 But, my first stop in the book was at the page for Trecce con Olive or Olive Twisty Bread. There are three variations for this bread shown in the book: olive, walnut, and zucchini. When I made this a couple of weeks ago, zucchini hadn’t quite come into season here yet, and I was so excited about the olive version I made the entire batch with an olive filling rather than making two loaves of each flavor. Making the dough begins a day in advance since it’s made with a biga. Flour, water, and yeast were combined, and the mixture spent the night in the refrigerator. The biga needs to come to room temperature before being mixed into the dough the next day. To make the bread dough, the biga was combined with water, olive oil, and malt syrup. Because the biga is a dry mixture, it takes a little work to break it up, and using your hands to mix it into the water is the best approach. Flour and yeast were added to the biga mixture and stirred with a wooden spoon. Salt was added, and the dough was kneaded until smooth but still somewhat tacky. This was a slightly wet dough but not unmanageable. While the dough was left to rise for an hour, the filling was prepared. In my case, I chopped olives and sauteed some garlic and red chile flakes in olive oil. The risen dough was divided into six pieces, and each piece was stretched to about 24 inches long. 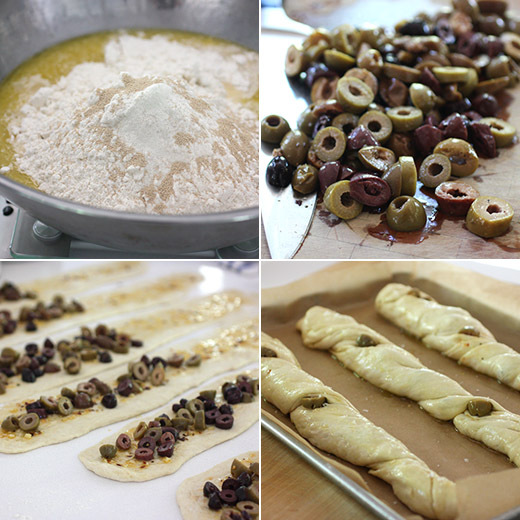 I brushed the pieces of dough with the garlic-chile oil and topped the bottom half of each piece with chopped olives. 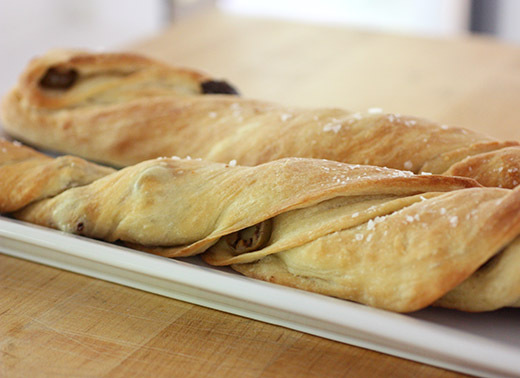 Each long piece of dough was folded over to enclose the filling leaving the sides open. Then, each piece was twisted to expose the filling in places. The tops of the loaves were brushed with more olive oil, and I sprinkled them with sea salt. They baked for about 20 minutes until golden. As the twisted dough baked, the edges became crisp and golden while the centers remained tender and full of olive flavor. These are great with a traditional accompaniment of wine keeping in mind “the ancient city was responsible for introducing vines and viticulture to every corner of its empire.” But, I can confirm that pieces of the olive breads are also delicious with more up-to-date gin cocktails. For tastes from both the past and present, you’ll find a lot to like in Tasting Rome.